Anderson has for some years now been touted as one of the leading figures in contemporary music, numbering figures like Oliver Knussen (the conductor on the winning disc) among his champions, and winning awards along the way. For more than a decade British composer Julian Anderson has been consolidating his reputation as a leading talent. This first CD shows that talent at full stretch. The music is always direct in its tone of voice and unfailingly approachable. The big orchestral canvases show Anderson's priceless gift for making complex formal shapes totally lucid. Oliuver Knusson's beautifully integrated performances with both the BBC Symphony and the Sinfonietta help inestimably, too. Anderson's stunning orchestral technique assures that the ear and mind are continually stimulated. Oliver Knussen (...) conducts (...) with passion and conviction, drawing virtuoso playing from the London Sinfonietta (...) and the BBC Symphony Orchestra. Oliver Knussen and the two British top ensembles are the best performers that Anderson could wish to interpret his works. This disc represents Julian Anderson's much-awaited recording début, featuring the première recordings of five of his most important works to date. Diptych (1990) was his first acknowledged work; it won the 1992 Royal Philharmonic Society Prize for Young Composers and was subsequently nominated as the BBC entry in the 1996 International Rostrum of Composers in Paris. 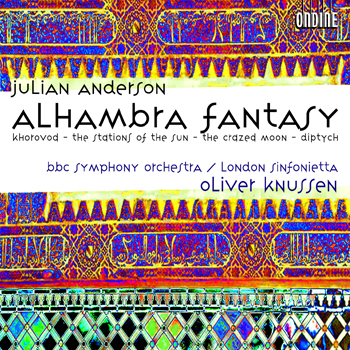 Anderson's two commissions for the London Sinfonietta, Khorovod (1994) and Alhambra Fantasy (2000), have been widely performed by leading ensembles across Europe and the USA. His other most played works include the orchestral BBC Proms commission The Stations of the Sun (1998). A terrifying poem by W.B. Yeats, as well as the experience of a lunar eclipse in March 1996 gave the inspiration to The Crazed Moon (1997), commissioned by BBC Wales. The recording was produced in association with the BBC Symphony Orchestra (tracks 2, 3, 5, 6) and the London Sinfonietta (1, 4). The composer himself was closely involved in the production process and as author of the booklet's liner notes.